Estimates of the Equilibrium Exchange Rate of the Renminbi: Is There a Consensus and, If Not, Why Not? The behaviour of the real effective exchange rate of South Africa: Is there a misalignment? 1. Do you agree with the barriers outlined in the Options Paper? If not, why not? The Needed Development of Multicultural Career Counseling Skills: If Not Now When? If Not Us Who? Scarcity is not the mother of invention! Why the ipad and not another device? Why not Pave the Tracks? Estimates of the Equilibrium Exchange Rate of the Renminbi: Is There a Consensus and, If Not, Why Not? William R. Cline and John Williamson Peterson Institute for International Economics Paper presented at the Conference on China's Exchange Rate Policy Peterson Institute, Washington DC October 12, 2007 © Peterson Institute for International Economics. All rights reserved. The extreme Big Mac estimate of 138 percent needed appreciation is omitted from this average because the “simple” PPP approach is widely regarded as inappropriate. 3 The corresponding drop in the bilateral correction from 42 percent to 38 percent is misleading because none of the enhanced purchasing power parity (PPP-E) studies are for the latter period, and it is this approach that systematically produces the highest estimates of undervaluation. 4 Thus, we fundamentally disagree with Dunaway, Leigh, and Li (2006) and Cheung, Chinn, and Fujii (2007) that the variations are so wide as to preclude drawing policy implications. FEER 0 to –5 Wren-Lewis (2004) 2003 19–22 FEER Average All 20 40 (d) Average A 2000–2004 17 42 (d) Average B 2005–07 27 38 (d) Notes: (a) BEER: behavioral equilibrium exchange rate. FEER: fundamental equilibrium exchange rate. PPP: purchasing power parity. –S: simple. –E: enhanced. (b) GS-DEER model. (c) Elasticities model (d) Excluding Big Mac. 3 This study first reviews methodological issues associated with the three main measurement approaches: purchasing-power parity (PPP), behavioral effective exchange rate (BEER), and fundamental effective exchange rate (FEER), as well as the concepts of multilateral (real effective) and bilateral misalignment. Next it examines the results of each of the studies considered, grouped by each of the three approaches. The paper concludes with a summary overview of the estimates and the reasons for the differences among them. Approaches and Methodological Issues5 PPP – One ancient if not very well-respected approach to identifying equilibrium exchange rates is to find the exchange rate that would lead to purchasing power parity (PPP). The Big Mac index of the Economist falls squarely into this category, even if the price index used to establish PPP contains only one good. Much more meaningful are the several estimates based on an “enhanced PPP” approach. This approach starts from the strong empirical regularity linking per capita income with the real effective exchange rate and rationalized by the Balassa-Samuelson analysis which suggested that the productivity rise associated with development is concentrated primarily in tradables. The consequence is that the ratio of the market exchange rate to the PPP exchange rate is well below unity for low-income countries, and eventually rises to approximately unity at the per capita income levels of the rich countries, as illustrated in Figure 1.6 Undervaluation or overvaluation is defined as the percentage by which a country’s exchange rate diverges from the regression line linking per capita income and the RER.7 It is possible for the regression line to take account of other variables beyond real per capita income that may systematically influence RERs, such as net foreign assets or the terms of trade. In this case, enhancement of the PPP approach goes well beyond including a Balassa-Samuelson effect and incorporates variables that often feature in the BEER approach, such as productivity growth and net foreign assets. Throughout this paper we measure the real effective exchange rate (REER) in the normal way, as the price of a nation’s output relative to the trade-weighted price of other nations’ outputs, typically as deflated over time by consumer price indexes. The Salter-Swan-Scandinavian-Chicago-Latin American alternative definition as the ratio of the domestic price of tradables to the domestic price of non-tradables will correspond to this measure so long as the price of tradables moves 1:1 with the exchange rate and the price of non-tradables is unaffected by the exchange rate. 6 Data are for 2005 for 138 countries with population exceeding 1 million (World Bank, 2007). 7 Note that this relationship is also used by Rodrik (2007) and Bhalla (2007) to identify undervaluation. Both authors argue that undervaluation can contribute to growth, Rodrik because of the need to offset purported greater contracting difficulties in the tradable sector and Bhalla more simply in a neo-mercantilist sense that does not take account of pressures on inflation that would result from chronic current account surpluses (Meade’s “internal imbalance). We are skeptical of the enhanced-PPP approach in general and its application to China in particular. One major limitation of the approach is that by definition it means the United States can never be over- or undervalued: the United States is the numeraire for PPP exchange rate equal to market rate. This is a gaping hole for an analytical approach, considering that the US current account deficit currently absorbs the vast bulk of combined surpluses of the rest of the world. More generally, there is ample historical experience (including that of China today) to show that the deviation of the PPP/market exchange rate ratio (PPP/er) from the international norm can be a wholly misleading guide as to whether the country has a current account surplus or deficit, let alone whether the balance is a meaningfully sustainable equilibrium. For China, it is well known that the available price surveys are much less reliable than for most countries.8 It is also well known that China is an extreme outlier, with low domestic prices. The presumption is thus that China’s prices have been measured unreliably at below actual levels. If so, then the percentage shortfall of x from the actual level will not only impute an undervaluation of x percent. It will also overstate the real per capita income on the horizontal axis, thereby making the seeming shortfall from the international line even greater and registering an undervaluation greater than x percent. Lardy, 1995; Cooper, 2005; Heston 2001. Data are from the IMF WEO data base. The PPP/er ratio is the ratio of GDP in dollars at purchasing power parity to nominal dollar GDP at the current exchange rate. The BEER approach was introduced by Clark and MacDonald (1998). They also provide the basis for the second of the IMF calculations of exchange-rate equilibria (IMF 2006). Without special treatment for component imports used in exports, Cline (2005) estimates that a 1 percent rise in the real exchange rate should be expected to reduce China’s current account balance by 0.3 percent of GDP. Exports of goods and services were 40 percent of GDP and imports 32 percent in 2006. Perhaps 40 percent of imports are for intermediates used in exports, so half of imports are re-exportable components and half are final goods. Suppose the price elasticity is unity for exports and for final-good imports. With unitary elasticity, appreciation will leave the renminbi value of final-good imports unchanged. The other half of imports will decline linearly with exports. So a 1 percent real appreciation will reduce exports by 1 percent or 0.4 percent of GDP, while reducing component imports by 1 percent or 0.16 percent of GDP, placing the overall result at 0.24 percent of GDP reduction in the current account. For an undervaluation of x percent, the appreciation needed for correction is: 100 ([1/(1-.01x] -1). The regression estimate is z = -.134 (.011) + 0.299 (.006) ln (y*/y*u), where z is the logarithm of the ratio of the market to the ppp exchange rate, standard errors are in parentheses, and the final term is the logarithm of China’s ppp per capita income relative to that of the United States (which turns out to be -2). The lower corridor for two standard deviations of the regression coefficients would turn this equation into: z = -.156 +0.311 ln(y*/y*u). Taking the corresponding exponents yields the text estimates. The authors use a higher index for more units of domestic currency per unit of foreign currency, so these estimates they cite for “undervaluation” are equivalent to percent revaluation implied. 17 Workshop on Policy to Reduce Global Imbalances, organized by the Peterson Institute, Bruegel, and the Korea Institute for International Economic Policy. Washington, February 8-9, 2007. Papers from the workshop are available at: www.PetersonInstitute.org (events). 18 In a subsequent letter to The Economist (July 14, 2007) the senior author gave a BEER estimate of renminbi undervaluation of 30 percent. Goldstein and Lardy (2007) estimate the 2007 outcome at 12 percent of GDP or more. The Goldstein-Lardy implicit parameter of 0.25 percent of GDP reduction in current account surplus for a 1 percent rise in the real exchange rate is virtually the same as suggested in note 13 above. 21 The first measures capacity by connecting cyclical peaks in output over time; the second generates a smooth non-linear representation of the time series. His biggest deficit target is one that was suggested by Williamson and a coauthor, in a period when it was widely held that developing countries ought to be importing real resources and there was little concern about having a competitive exchange rate. 15 Wang’s view implicitly assumes that world welfare is maximized by allowing countries that wish to save in excess of the level of investment that is efficient at the world interest rate to do so, and export the resulting savings in the form of a current account surplus. The counter-argument is that this assumes (a) that a national government’s decision should be accepted uncritically as the judge of what is in the social interest of its citizens and (b) that there is no problem of world consistency of current account objectives that needs to be dealt with. On (a), it is relevant to note that there are still about a hundred million desperately poor people in China, who save a lot partly because much of the saving is corporate and is not their decision at all, and partly because they are afraid of the future because of the lack of a safety net. Their interests deserve to be taken into account by the international community even if they are ignored by the Chinese government. If one holds this view, then a current account close to balance seems a more natural target than a large surplus. Chinese policy should be aiming to reduce the savings rate (as indeed it is, at least in theory). We do not attempt to deal with problem (b) here. Another obvious source of difference in FEER estimates is differing assumptions about the trade elasticities.23 Anderson uses an export elasticity of 0.5 (which he asserts is probably too high) and an import elasticity of 0.8. Cline assumes that all price elasticities, both of exports and imports, are of unity. Couhert and Couharde take their elasticities from the NiGEM model, in which all elasticities satisfy the Marshall-Lerner condition (though in the case of the United States they only just satisfy it) and vary from 0.50 to 1.19 for the export price elasticity and from 0.41 to 0.95 for the import price elasticity. Neither Goldstein nor Goldstein and Lardy state their assumed elasticities, but they state that they are conventional. Jeong and Mazier also take their elasticities from other models, with specifications similar to their own, and compare the estimated elasticities from different models. Wren-Lewis uses export price elasticities of 2 and import price elasticities of 0.5. None of the enhanced PPP estimates include multilateral realignment, so all are treated as bilateral. The Big Mac simple PPP is excluded as conceptually flawed. 16 for the renminbi, whereas the simple averages for the bilateral real appreciations given by the BEER and FEER approaches are smaller, at 25 and 36 percent respectively. The simple averages for the multilateral real revaluations in the BEER and FEER approaches are more moderate still, at 18 percent and 21 percent respectively. It is evident in the figure that there is considerably more agreement among the PPP-E estimates than among the BEER estimates. The FEER estimates also show more agreement than the BEER estimates if the two outliers proposed by Wang (2004) are excluded. 18 double digits as a percent of GDP, so the needed correction is several percentage points of GDP. Finally, it should be reiterated that most of the studies surveyed here were conducted using the lower earlier levels of the current account, so the needed real effective appreciation could be larger than the 25 percent or so real effective range suggested by the international-BEER and most of the FEER studies if there have been structural changes toward a current account surplus. For example, using the parameter suggested both here and in Goldstein and Lardy (2007), that a 10 percent real exchange rate change with supporting expansion of internal demand leads to a change of about 2.5 percent of GDP in the current account, complete elimination of the 2007 surplus could require as much as a 48 percent real effective appreciation. However, it seems likely that a significant part of the surplus is cyclical. In particular, application of this same parameter to the effective real depreciation of the renminbi in recent years cannot explain the full surge in the surplus. The IMF and BIS place the real effective depreciation of the currency from 2002 to 2006 at 8 percent, deflating by consumer prices. The decline reflected the renminbi riding the dollar down. If one adopts the Goldstein-Lardy argument of additional productivity influences and places the relative price change for China’s exports at zero (rather than the cumulative CPI inflation of 8 percent) over these four years, the real effective depreciation would have been about 16 percent. But application of the parameter just discussed would then have implied a rise of the surplus by 4 percent of GDP, not by 9 percent of GDP (the increase from 2003 to 2007). Anderson (2006) suggests that excess capacity in heavy industry following unusually large investment spurred atypical exports in 2005 and after, indicating one possible source of cyclical exaggeration of the surplus this year. As a consequence, whereas some of the studies surveyed in this study using data before 2004 may have understated the extent of exchange rate correction needed by 2007, application of a FEERs approach to the full magnitude of the 2007 surplus rather than some cyclically adjusted estimate would seem likely to overstate the correction needed. Anderson, Jonathan. 2006. The Complete RMB Handbook (fourth edition). (Hong Kong: UBS.) Bénassy-Quéré, Agnès, Pascale Duran-Vigneron, Amina Lahrèche-Révil, and Valérie Mignon. 2004. Burden Sharing and Exchange Rate Misalignments Within the Group of Twenty. In C.F Bergsten and J. Williamson, eds., Dollar Adjustment: How Far? Against What? (Washington: Institute for International Economics). Bénassy-Quéré, Agnès, Amina Lahrèche-Révil, and Valérie Mignon. 2006. World Consistent Equilibrium Exchange Rates. (Paris: CEPII working paper no. 2006-20.) Bhalla, Surjit S. 2007. There Are No Growth Miracles. Paper presented to a seminar at the IMF. Bosworth, Barry. 2004. Valuing the Renminbi. Paper presented to the Tokyo Club Research Meeting, Feb. Cheung, Yin-wong, Menzie D. Chinn, and Eiji Fujii. 2007. The Overvaluation of Renminbi Undervaluation. NBER Working Paper no. 12850. Clark, Peter, and Ronald MacDonald, 1998. Exchange Rates and Economic Fundamentals: A Methodological Comparison of BEERs and FEERs. IMF Working Paper 98/67. Cline, William R. 2005. The United States as a Debtor Nation. (Washington: Institute for International Economics and Center for Global Development.) ---- 2007. Estimating Reference Exchange Rates. 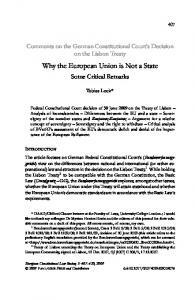 Paper presented to a workshop at the Peterson Institute sponsored by Bruegel, KIEP, and the Peterson Institute, Feb. Cooper, Richard, 2005. Whither China? Japan Center for Economic Research Bulletin, September. Coudert, Virginie, and Cécile Couharde. 2005. Real Equilibrium Exchange Rates in China. CEPII Working Paper no. 2005-01. Dooley, Michael, David Folkerts-Landau, and Peter Garber. 2003. An Essay on the Revived Bretton Woods System. NBER Working Paper no. 9971. Dunaway, Steven, Lamin Leigh, and Xiangming Li. 2006. How Robust are Estimates of Equilibrium Real Exchange Rates: The Case of China. IMF Working Paper no. 06/220. 20 Dunaway, Steven, and Xiangming Li. 2005. Estimating China’s “Equilibrium” Real Exchange Rate. . IMF Working Paper no. 05/202. Frankel, Jeffrey. 2006. On the Yuan: The Choice between Adjustment under a Fixed Exchange Rate and Adjustment under a Flexible Rate. CESifo Economic Studies. Funke, Michael, and Jőrg Rahn. 2005. Just How Undervalued is the Chinese Renminbi? The World Economy, 28(4), April. Goldstein, Morris. 2004. Adjusting China’s Exchange Rate Policies. Paper presented to the IMF seminar on China’s Foreign Exchange System at Dalian, China, May. Goldstein, Morris, and Nicholas Lardy. 2006. China’s Exchange Rate Policy Dilemma. American Economic Review, 96(2), May, pp. 422-26. Goldstein, Morris, and Nicholas Lardy, 2007. China’s Exchange Rate Policy: An Overview of Some Key Issues. Paper prepared for the conference on China’s Exchange Rate Policy, Peterson Institute for International Economics, Washington, October 19. IMF. 2006. Methodology for CGER Exchange Rate Assessments. (Washington: International Monetary Fund). Heston, Alan, 2001. Treatment of China in PWT6. Philadelphia: University of Pennsylvania, processed. Available at: http://pwt.econ.upenn.edu/Documentation/China.PDF Jeong, Se-Eun, and Jacques Mazier. 2003. Exchange Rate Regimes and Equilibrium Exchange Rates in East Asia. Revue économique, 54(5), Sep., pp. 1161-82. Lardy, Nicholas R., 1994. China in the World Economy (Washington: Institute for International Economics). MacDonald, Ronald, and Preethike Dias. 2007. BEER Estimates and Target Current Account Imbalances. Paper presented to a workshop at the Peterson Institute sponsored by Bruegel, KIEP, and the Peterson Institute, Feb. Meade, James E. 1951. The Balance of Payments. Oxford: Oxford University Press. Nurkse, Ragnar. 1945. Conditions of International Monetary Equilibrium. Princeton Essays in International Finance no.4. (Princeton: International Finance Section.) Rodrik, Dani. 2007. The Real Exchange Rate and Economic Growth: Theory and Evidence. Harvard University: processed. 21 Stein, Jerome. 1994. The Natural Real Exchange Rate of the US Dollar and Determinants of Capital Flows. In J. Williamson, ed., Estimating Equilibrium Exchange Rates. (Washington: Institute for International Economics). Stolper, Thomas, and Monica Fuentes. 2007. GSDEER and Trade Elasticities. Paper presented to a workshop at the Peterson Institute sponsored by Bruegel, KIEP, and the Peterson Institute, February. Wang, Tao. 2004. Exchange Rate Dynamics. In E. Prasad, ed., China’s Growth and Integration into the World Economy: Prospects and Challenges, IMF Occasional Paper no.232 (Washington: International Monetary Fund). Williamson, John. 1983. The Exchange Rate System. 1st edition, 2nd edition 1985. (Washington: Institute for International Economics). Williamson, John, and Molly Mahar. 1998. Current Account Targets. In S. Wren-Lewis and R. Driver, Real Exchange Rates for the Year 2000 (Washington: Institute for International Economics). World Bank, 2007. World Development Indicators (Washington: World Bank). Wren-Lewis, Simon. 2004. The Needed Changes in Bilateral Exchange Rates. In C.F. Bergsten and J. Williamson, eds., Dollar Adjustment: How Far? Against What? (Washington: Institute for International Economics). Report "Estimates of the Equilibrium Exchange Rate of the Renminbi: Is There a Consensus and, If Not, Why Not?"